Sworn in as prime minister of Australia just eight weeks before Japan launched war in the Pacific, John Curtin had a gruelling few years as the country’s leader — but in many ways his leadership shaped modern Australia. 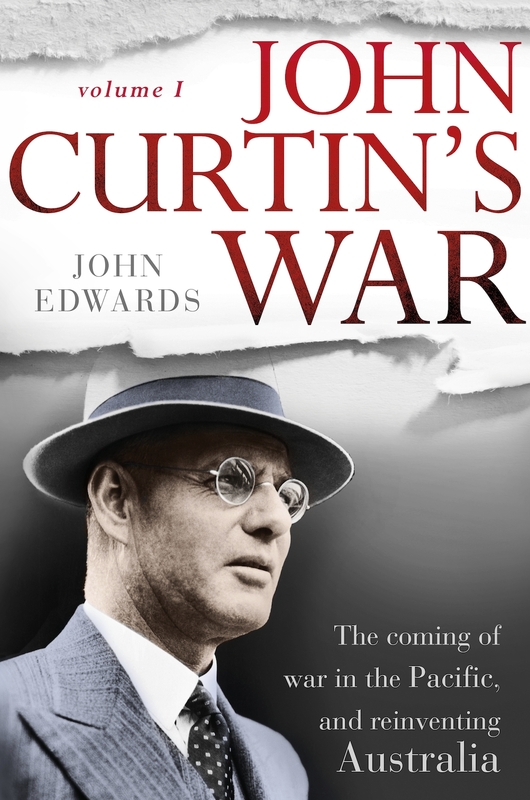 In the first instalment of a landmark two-volume biography of this most underrated of PMs, John Curtin’s War, John Edwards looks at Curtin’s story from the late nineteenth century through to the early period of the Japanese military onslaught. Below is an extract from the new book. In the group photograph of the new ministry taken on the morning of 7 October 1941 twenty men in suits are arranged in two rows, one row sitting and one standing. John Curtin is in front, sitting next to the Governor-General, Lord Gowrie. Curtin’s hands are folded, right over left. He has thinning grey hair and wears spectacles. In this photo he cannot hide the cast in his left eye by looking down or turning side-on to the camera. He wears a white shirt and a dark three-piece suit with a high waistcoat. In the breast pocket of his suit there is a folded triangle of white handkerchief. It is a black and white photograph but we know Curtin is in his good blue suit, not only because it is the one he usually wears on formal occasions but also because he has only three, and this is neither the brown nor the blue with the white pencil stripe. He wears his black shoes, not the brown. Of his six ties he has chosen one that is plain and dark. In this photograph of Curtin a few moments after his swearing-in as Prime Minister and Minister for Defence Co-ordination we cannot see what he is, but we can see what he is not. In his expression there is no grandeur, no easy command, no triumph. He looks, as always, ill at ease, as though caught in a conversation from which he hopes soon to excuse himself. Those who know him well will remember his sincerity, his intelligence, his reserve. They will not recall him as an imposing man, like his political opponent Bob Menzies. He is, as one of his secretaries, Hazel Craig, would say, ‘a very, very normal nice human being’. He is also an adroit and accomplished politician, unusually free of vanity or illusion. He is often underestimated, which does not trouble him at all. It was only later, long after this photograph was taken, long after he was buried among the pines and gums at Karrakatta, that Artie Fadden would remember him as the greatest leader of his time in politics, and Harold Cox, an unsentimental reporter who has seen many prime ministers come and go, would say of Curtin that he was the biggest figure in Australian politics since the colonies federated in 1901. Curtin does not look like a great man, Menzies will one day write, though ‘he undoubtedly became one’. Curtin is Australia’s third prime minister in six weeks. He leads the the first federal Labor government in a decade. He is fifty-six years old and it is the first time in his life he has held ministerial office. Ten years ago Curtin was so frequently drunk his colleagues referred to him as ‘Poor John’. He has been sober for the last six years, but he is not a healthy man. Patches of his skin are sometimes red and inflamed with psoriasis. He has spent many days in the last month lying on his bed at the Hotel Kurrajong, tormented by neuritis. Already he has heart disease. In the less than four years of life he has remaining he will do things that even now, posing for this ceremonial photo and already impatient to be driven back to Parliament House to chair his first Cabinet meeting at noon, he does not intend or expect or even imagine. John Curtin, seated third from left. Courtesy RandomHouse. Sworn in moments before, the new ministers pose in front of the fluted columns of the portico of Yarralumla, not long ago the home of Scottish settlers who farmed sheep on the high Monaro plains. Of the nineteen other men in the photograph, men who are to write themselves into the Australian story over the remainder of the decade, one whose company Curtin finds congenial is Gowrie. Canberra in 1941 has a population of only 9000 people. Curtin hates flying and the journey home by train takes four days, first to Melbourne, then Adelaide, then across the Nullarbor Plain to Kalgoorlie and then to Perth. When Parliament is sitting he mostly stays in Canberra while his wife, Elsie, takes care of the family and the cottage in the Perth beachside suburb of Cottesloe. Some weekends, after writing to Elsie from his room at the Kurrajong, Curtin visits Gowrie and his wife for tea. Gowrie is sixty-nine and won his Victoria Cross fighting the Dervishes in the Sudan Campaign at the end of the nineteenth century. At the time Curtin was a sixteen-year-old messenger boy in a Melbourne club. Blue-eyed, pink-cheeked, white-haired and usually dressed in a superbly tailored pinstripe suit, Gowrie is an English gentleman. His father was a baron, his mother’s father an earl. He pronounces ‘coming’ as ‘comin’ – there are no ‘gs to his ‘ings’. Gowrie respects Curtin but he would very much prefer that Menzies was still prime minister, perhaps in an all-party government like Britain’s. He plans to write to the Secretary of State for Dominion Affairs, Viscount Cranborne, suggesting a seat be found for Menzies in the House of Commons. On the other side of Gowrie, Deputy Leader of the Labor Party Frank Forde looks unexpectedly glum. Steady, loyal and reliable, Forde is a good deputy. Next to him is the Attorney-General and Minister for External Affairs, Bert Evatt. Even in the still photograph Evatt seems to bustle with impatience. Immensely intelligent and hard-working, he has been a successful barrister and a High Court judge. Soon, Roosevelt and Churchill will be amused by his many peculiarities. Curtin values Evatt’s brilliance but distrusts his common sense. For most of the past year he has been fighting with Evatt over political tactics. Even now he rightly suspects that Evatt believes the Curtin Government will not last long, and will soon be succeeded by an all-party government in which Evatt hopes to have a prominent place. Curtin knows that Gowrie also believes this, as do the leaders of the United Australia Party and the Country Party. He knows they may well be right. Treasurer Ben Chifley sits beside Curtin, glancing away from the camera. He has been back in federal Parliament for only a year, but already Curtin thinks of him as his closest lieutenant. They were allies in the fight against the populist demagogue Jack Lang in New South Wales, and his supporters in federal Parliament. The leader of the Lang faction now sits with them in the front row of the ministerial photo – Jack Beasley has been back in the Labor Party only since March. Ten years ago he helped to finish off Scullin’s Labor Government and force an election in which both Curtin and Chifley lost their seats. In appointing him Minister for Supply and Development, Curtin has given Beasley a big job. He hopes he will want to keep it. Lang may be a spent force but Curtin wants to keep Beasley separated from his sometime ally Eddie Ward, whom Curtin has been unable to prevent from winning a position in the ministry. Ward now stands in the back row, looking down at Curtin before him. His hair is swept back, his boxer’s shoulders set. He is Curtin’s enemy. Menzies will later tell the United States Consul at lunch in Melbourne that the new ministers are ‘scum – positive scum’. In their suits and ties they do not look like radicals. For some of those looking at the camera on the portico at Yarralumla, the pleasure of being sworn in as new ministers on a fine spring morning in Canberra shines through. Australia is at war, so they also strive to be dignified and solemn.